On the first trading day of the new year, Data Bao combed a list of 2018 dividend distribution plans, hoping that the A-share market could “open the door” in 2019. Before and after the Spring Festival, the high-speed transfer section staged "Festival Carnival"
The dividend plan has also entered an intensive period with the disclosure of the annual report. The data of the treasure statistics from October 19, 2018 to the latest closing date, the Shanghai index rose 5.3%, while the high-send index rose more than 30%. 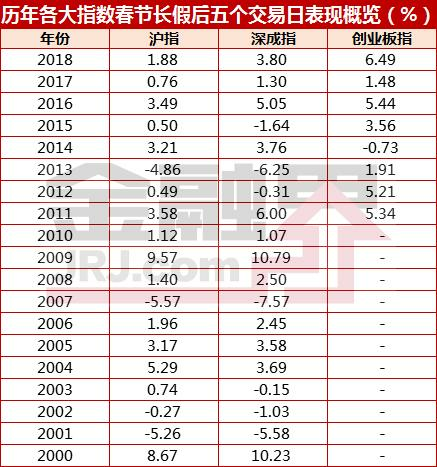 From the performance of the Spring Festival before and after, since 2016, the high transfer index (Straight flushIn the five trading days before and after the Spring Festival, there was a rise in the market and a sharp victory over the Shanghai index. 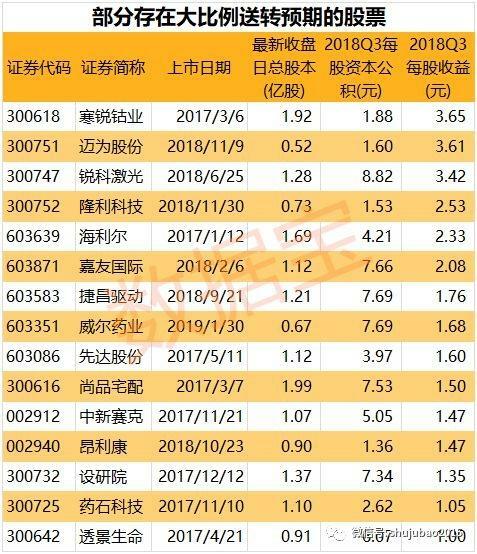 On the 5th day after the Spring Festival in 2016, the high delivery index rose by 10.44%; in the downturn of the 2018 market, the high sent-to-index index rose by 6.56% against the trend on the 5th. Data treasure statistics show that as of February 11, except for one stop implementation sample, a total of 43 shares in the two cities issued a 2018 annual dividend plan.In terms of industries, the above 43 shares are distributed in 19 Shenwan industries, which are densely distributed in the pharmaceutical, biological, chemical and mechanical equipment industries, with more than 4 stocks. Among them, 2 households have a large share of gold dividends per 10 shares, with an average value of more than 20 yuan, followed by commercial trade stocks, and the average value of the distribution is as high as 16 yuan. From the perspective of the industry's transfer ratio, the machinery, defense, military, computer and media industries have more than 8 shares for every 10 shares. Specific to individual stocks, 17 shares are sub-new shares with a listing date of no more than 3 years.Aipeng MedicalOn February 2nd, the dividend plan was issued. The cash dividend for every 10 shares was 4 yuan. From January 28 to February 1, the stock price rose 15.53%.Xingrui TechnologyOn January 22, the plan was issued, and 3 yuan was distributed for every 10 shares and increased by 6 shares;Top solid setOn January 16th, the plan was released, and every 10 shares were distributed at 2.2 yuan and increased by 8 shares. It is worth mentioning that these 2 shares are all sent high, and the daily forecast is reported to the daily limit. From the point of view of the faction,40 shares will be paid. A total of 8 shares of more than 5 yuan (per 10 shares) are distributed.Little Swan AThe dividend for every 10 shares is as high as 40 yuan, which is the largest since the company was listed in 1997.Lanzhou MinbaiThe cash dividend for every 10 shares is also as high as 16 yuan;Donggang Stock,Chuanhuan Technology,Fu AnnaAll stocks are on the high dividend list. In fact, according to the new rules of high delivery (the main board 10 to 5, the small and medium board 10 to 8, the GEM 10 to 10), 21 to send shares are not high. Specifically,Zhengye TechnologyThe most generous, with a distribution of 4.2 yuan for every 10 shares, it will increase by 9.5 shares;Sailing new material, every 3 shares are now 3 yuan and increased by 9 shares. Zhengyuan wisdom,Naiwei TechnologyThe dividends are all very generous, and the latter has been distributed every year since its listing in 2015. at the same time,Space intelligence,Sanxiang New Material,Baichuan EnergyandXin FengmingThe transfer ratio is less than 50%. From the market performance on the day of the plan,In addition to the new materials, the remaining 7 shares rose. The 5 shares of gold are extremely strong, and the daily limit is up, including Zhengye Technology, Zhengyuan Wisdom, and Chuanhuan Technology. It is worth mentioning that 43 out of the dividend distribution and transfer plan stocks, the number of stocks rising on the pre-disclosure announcement accounted for more than 70%, and there were 7 stocks on the day of the plan. The high-transfer new regulations are gradually overweight, and the number of stocks that satisfy high delivery is also gradually decreasing. According to the screening conditions of high delivery: the latest total share capital is less than 200 million shares, listed after 2017, the net profit growth rate for two consecutive years (including the lower limit of net profit growth in 2018) is greater than 0 and the capital reserve of each of the first three quarters of 2018 and Earnings per share exceeded 1 yuan. A total of 15 shares meeting the above 5 conditions, includingHanrui Cobalt,Maicheng,Ruike LaserWait. Zhengye Technology received a letter of concern: Explain that after lowering the performance expectation, it is still high and reasonable.